In 1988, I painted a series of pictures for a module on the sociology of peace and justice taught by Kevin Clements at the University of Canterbury, New Zealand. The pictures were my attempt at a creative interpretation of some key issues facing Africa’s struggle to overcome the violent and distorting legacy of colonialism and achieve a better future. Below I reproduce some often blurry photos of the original paintings and the text which accompanied each one. Please remember I wrote this in 1988 when I was much younger than I am today. 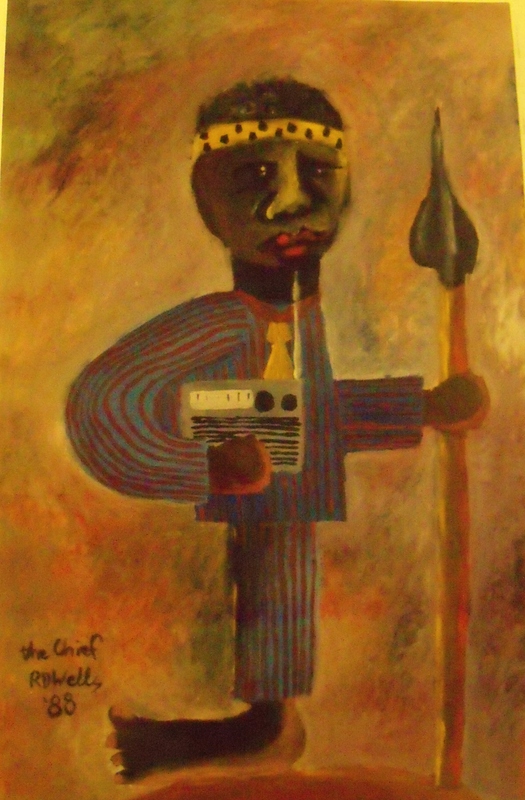 The Chief – oils on board, 1988. The idea for this painting came from a photograph which my father has of a loc al chief who used to visit our mission-station. He was dressed as a European and carried a modern ‘wireless’, but he also carried a traditional spear. The painting points to the inherent conflict in modern African life between the traditional ways, and the secularisation which invariably comes with Western technology. It is a conflict involving all areas of life. The consequences of losing a balance between the old ways and the new ways could be very serious. The Chief is given a kind of universal significance by the earth-like dome on which he stands. 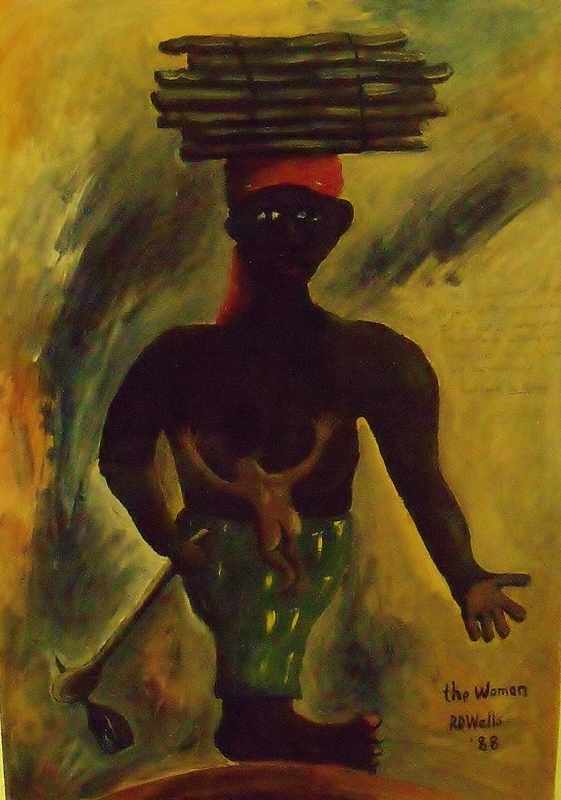 The confused background suggests the whirlwind nature of the conflict that he is in, although the rich colours could also suggest the passionate history of the African people. The single leg could imply the distorting and crippling effect that Western civilisation is having on the lives of ordinary Africans, as well as the way in which the new ways undermine traditional authority structures. The Woman – oils on board, 1988. 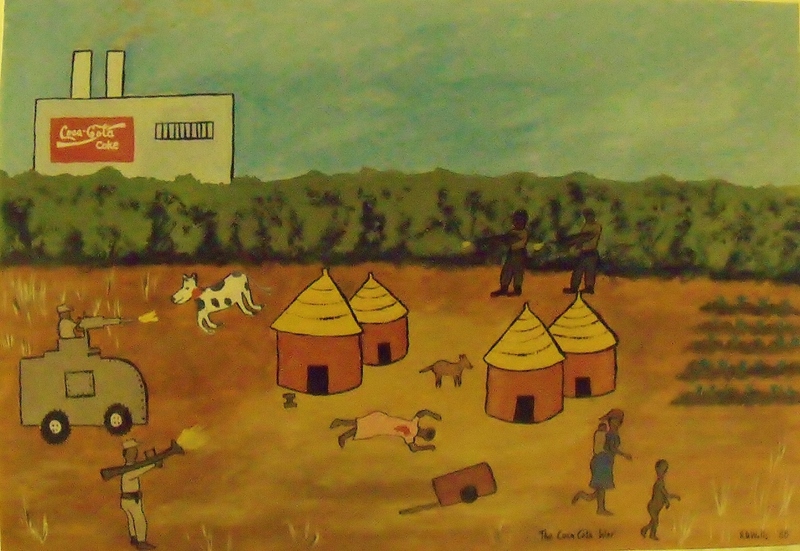 This painting was based on a quote from David Lamb’s book, The Africans, which states: ‘The African woman produces 70 percent of the food grown on the continent… women are responsible for gathering wood, raising children and harvesting crops.’ In other words, women in Africa carry a very oppressive work load. However, the analysis goes deeper than this. Most of the aid send to Africa is aimed at employing and helping men; power is put into the hands of men. It is likely that this is one of the reasons why aid has been so ineffectual in Africa. More could be achieved by empowering women instead. The style and significance of the symbols is similar to that of The Chief. Again, she is given universal significance, and the baby, hoe and wood indicates her role. The empty hand is waiting to be filled. The stormy background could be gathering conflict, as women gain a measure of consciousness and challenge traditional roles and contemporary aid schemes. 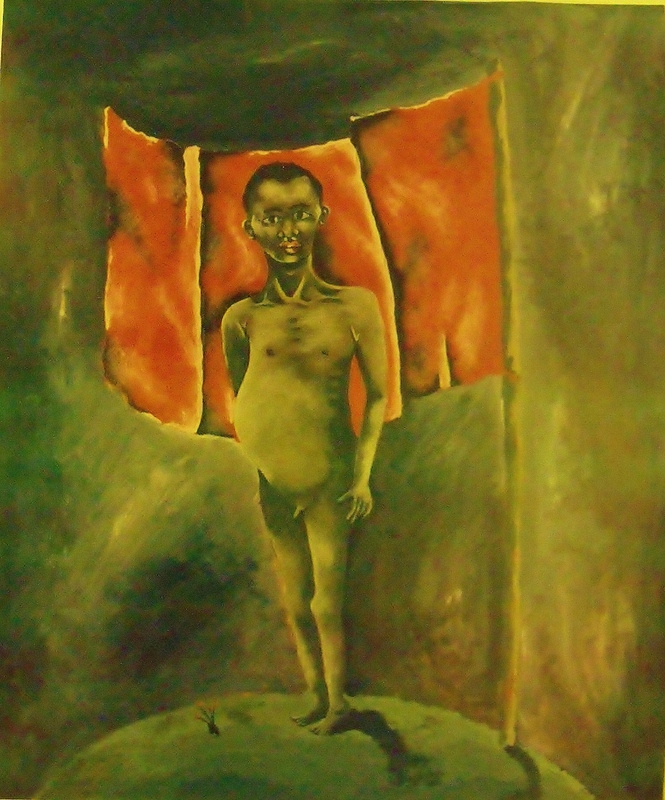 Picture of Poverty – oils on board, 1988. This painting is based on a photograph my father took of a starving woman in an area only 50km away from our mission-station. We delivered food supplies to the stricken region. The distorted nature of the woman’s face and arms shows the way that poverty and hunger can destroy the humanity of people. The inappropriate nature of much aid (coca-cola aid) is shown by the half-eaten five dollar bill and the coke can. The ambiguous nature of media attention is hinted at by the TV image and its life-line to the woman’s head. The background and style is pessimistic, heightened by the setting sun. The contribution of civil violence is hinted at by the US Army dress that she is wearing; in many parts of Africa, famines are exacerbated by continuing armed conflict. The picture challenges policy-makers to find better methods of helping people who are starving in absolute poverty. 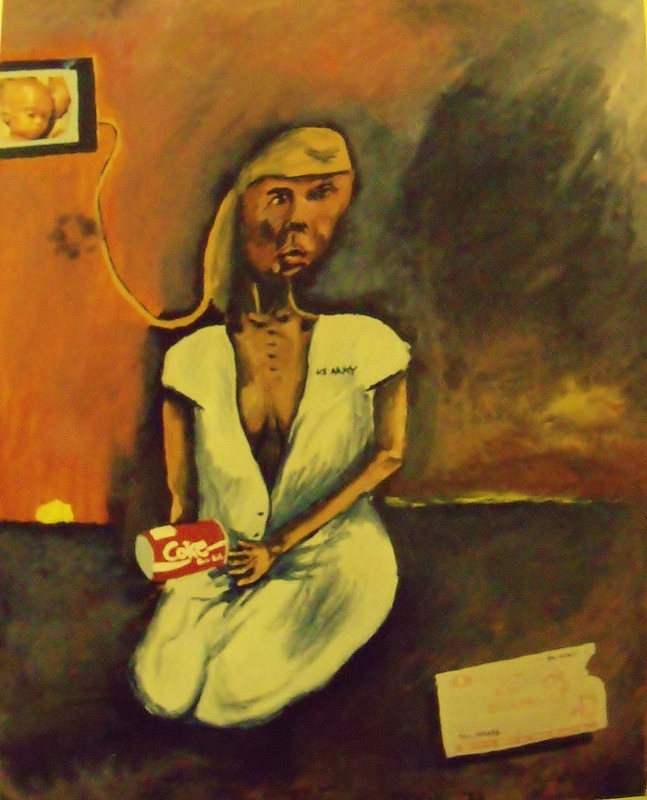 The Coca Cola Wars – oils on board, 1988. This picture is an investigation into the positive and negative contributions of multi-national companies to Africa’s problems. It also looks at the effect that both repressive and revolutionary violence has on ordinary Africans. While multi-nationals often bring capital and employment, they also tend to rely on oppressive structures to keep them as high profit ventures. This can lead to a situation where the government has to use widespread terror tactics to quell opposition. This in turn, can lead to revolutionary groups employing the same tactics to fight the government. The style is based on several African artists who used to come knocking on our door trying to sell their paintings. It is a very honest style that indicates a specific world view. There is no divide between earth and sky but all the specifics are outlined. This indicates how everything has its place in the scheme of things. The colours are flat, there is no shading, which again indicates a world view where concepts are easily identified. Also, the size of the human figures relative to the huts, cow and cart also indicates a world view where humans are important, although not absolute. The Beast They Call the Revolution – oils on board, 1988. This painting was inspired by the words of a Bruce Cockburn song: ‘See the loaded eyes of the children too/ trying to make the best of it the way kids do/ One day you’re going to rise from your habitual feast/ to find yourself staring down the throat of the beast/ they call the revolution’. Throughout my painting project, I began to see how bleak the future looks for poor nations. Although I am a strict pacifist, I began to realise that if I was faced by similar life conditions, revolutionary action would become a very real temptation. I do not condone revolution of a violent nature, but I do sympathise with it. The hungry naked boy, with a bloated belly caused by malnutrition, does not think of violent revolution. His eyes are innocent. But as he grows up and his life chances don’t change, the banner of revolution will beckon. He is a universal child representing millions in the same situation who have grown up in an age of revolution. This picture is both defiant and mournful, but the small flowers of peace wait by his feet. Maybe they are also the flowers of hope. This entry was posted in structural Violence. Bookmark the permalink. Thanks for your comment. I have not yet joined the Twitter revolution, but I plan to next year. When I do, I will post here. I would like to use your painting :The Woman – oils on board, 1988. on a book cover. In a few days I will be giving my Inaugural Professorial Lecture. It is a time to reflect on the journey that has brought me to this place. Kevin Clements will be introducing me at the lecture, so it seemed appropriate to reblog this post about our first meeting 25 years ago. Hi, I was curious about your thoughts on the recent raids toward al shaabab by the US?